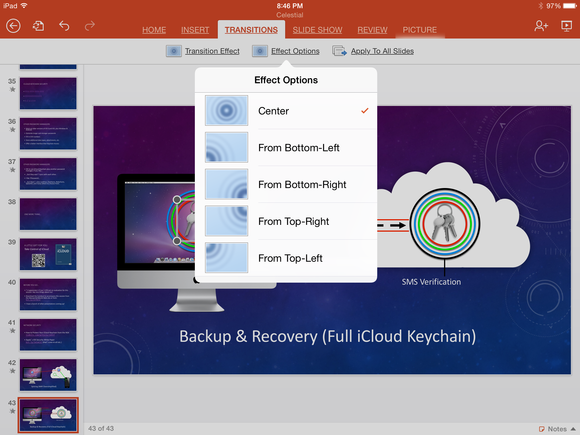 Microsoft’s PowerPoint for iPad finally makes it possible to open, edit, create, and present native PowerPoint files on your iPad, no file conversion required. 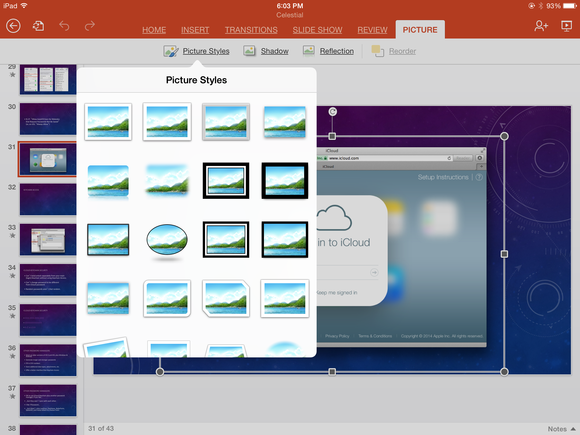 This is a huge benefit for anyone who frequently uses PowerPoint on a Mac or PC but likes the iPad’s portability. But comparisons with PowerPoint for OS X 2011 (4.5 mice, $119) on the one hand, and Apple’s Keynote 2.0 for iOS (4.0 mice, free) on the other make it clear that, though PowerPoint for iPad is very nice as far as it goes, it doesn’t go far enough. Like the other Office for iPad apps, PowerPoint requires you to have an Office 365 subscription—either Office 365 Home Premium ($9.99 per month), the upcoming Office 365 Personal ($6.99 per month), or one of several business options—if you want to create or edit presentations on your iPad. Each such subscription includes access to OneDrive, Microsoft’s cloud-storage solution, which you’ll need to transfer files to and from your iPad. (You can also add a SharePoint location.) Alternatively, if another app contains a PowerPoint file, you can use the Open In command to send it to PowerPoint. There’s no support for other cloud storage services, such as Dropbox. You can use any cloud storage service for your documents, as long as it's OneDrive, OneDrive for Business, or a SharePoint folder. PowerPoint can read .ppt files but prompts you to tap a link that converts them to the newer .pptx format before they can be edited. All the PowerPoint files I imported from my Mac opened without incident. 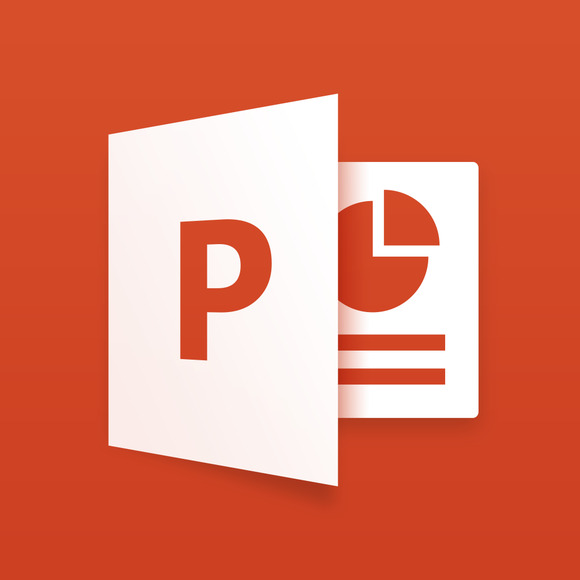 Whatever else you might say about PowerPoint for iPad, Microsoft got the touch interface right. This is a real iPad app, with evident care given to easy fingertip operation. The controls are all where you expect them to be, and every operation from applying boldface to rotating a graphic is intuitive and obvious. Anyone who has used PowerPoint on a Mac, or pretty much any iOS app, should be able to pick up PowerPoint for iPad in moments. When creating a new slideshow, you can choose from among 20 themes, each in your choice of widescreen (16:9) or standard (4:3) aspect ratios. Oddly, there is zero overlap between the themes in the iPad version of PowerPoint and those in the Mac version—and no facility to create new ones. The iPad version also lacks templates (which supplement themes with sample content you can customize quickly). PowerPoint for iPad includes a reasonable array of text editing controls—you can adjust font, size, style, color, alignment, and indentation; apply bulleted or numbered lists in a variety of styles; and use any of 20 predefined text styles. You can also add and format tables, a number of shapes and lines, and graphics from elsewhere on your iPad. Although you can apply picture styles (that is, frames), shadows, and reflections to imported images—and resize or rotate them to taste—you can’t crop them. PowerPoint for iPad includes no built-in chart capability, but you can copy a chart from Excel for iPad and paste it into a slideshow. You can choose from several predefined Picture Styles, which include frames and other visual elements. You can adjust the front-to-back layering of each element on a slide, and you can apply any of 36 slide transitions, including 11 that don’t appear in PowerPoint for OS X. Control over transitions is limited, however—for example, you can choose a direction for a wipe or dissolve effect, but not its duration, sound effects, or delays. Unfortunately, that’s pretty much the extent of what you can change on a slide. You can neither add animations nor edit animations already present in imported slideshows. (Although existing animations do appear when you play a slideshow.) There’s no SmartArt and no support for audio. Any videos in a slideshow appear as static thumbnails. You can reorder slides but there’s no Outline view. And although you can see comments added in the desktop version of PowerPoint, you can’t edit or delete them, nor add new comments. I kept expecting to see another few tabs with more of PowerPoint’s features, but they simply aren’t there. PowerPoint for iPad lets you apply transitions to slides and adjust major attributes but not detailed settings such as duration or sound effects. When it comes to playing a slideshow, PowerPoint is also a bit disappointing. On the plus side, as in Keynote for iOS, you can touch and hold for a simulated laser pointer, and you can write on the screen with a pen or highlighter. There’s also a black-screen button, which Keynote lacks. But there’s no presenter view—your slideshow always displays full screen. It’s especially weird that you can add and edit speaker notes, but you can’t see them during your slideshow. There’s also no on-screen timer or thumbnail view while presenting, even when using AirPlay or a video adapter connected to an external display; Keynote offers both. Microsoft declined to comment specifically on if or when any of these missing features would be added, but did point out that the company has made quite a few updates to Office 365 in the last year, and noted that it is listening to customers’ feedback. I was pleased to see that what’s in PowerPoint for iPad works well, but there’s just not enough of it yet. Keynote for iOS is, on the whole, considerably more powerful (and works even on an iPhone, which PowerPoint does not). If you’re accustomed to PowerPoint 2011 on OS X, you’ll almost certainly be frustrated by missing features, especially when playing a slideshow on an external display. But for all that, PowerPoint 1.0 is a good starting point, and shows considerable promise for the future. Laudable touch interface offset by limited feature set. Cleanly imports presentations from other platforms.